Featuring some of the top young talent in North America, the incredible list of players that make up the 2016 and 2017 USA Football sets are making their impact on college football programs around the country. These cards, found exclusively on Upper Deck e-Pack™, are often the first ever cards of these up-and-coming stars! 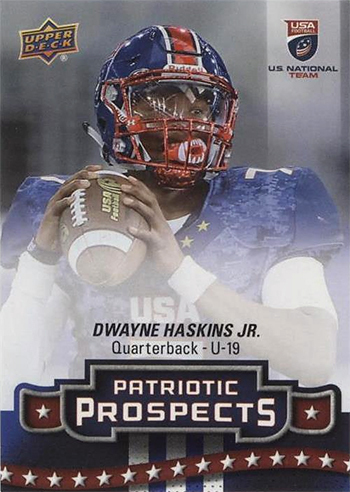 One of the stand outs from 2016 USA Football is current college sophomore Dwayne Haskins Jr. Since his arrival on campus in Columbus, Ohio in the fall of 2017, Haskins Jr. has made his presence known and has been a difference maker for his team. In games where Haskins Jr. started at quarterback this season, his team had an impressive 12-1 record and averaged over 43 points per game. At the conclusion of the regular season, the quarterback boasted over 4500 passing yards, 47 passing touchdowns, and ran for an additional 4 touchdowns. 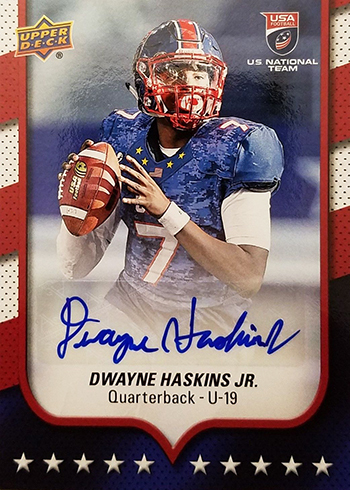 Dwayne Haskins Jr. has already starting racking up the postseason awards and is currently on the shortlist for an extremely prestigious, end-of-season award. 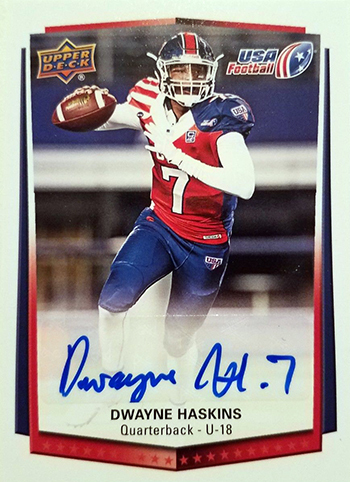 Be sure to pick up your packs of 2016 USA Football cards today for a chance at pulling one of Dwayne Haskins Jr.’s cards while they’re hot! Join Upper Deck e-Pack today!